Are you there, Lakers? It's me, David. Are you there, Lakers? It’s me, David. Bros. Tonight’s the night. I know no NBA team has ever come back from a 3-1 deficit in the finals. 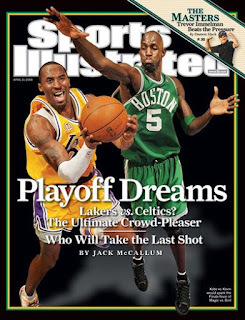 I know you’re playing Game 6 in Boston, the site of so many crushing Laker defeats. I know you’ve blown lead after lead this series, including that embarrassing Game 5 performance where Kobe had the ball in his hands for two minutes, tops and you won by blind luck and a miracle steal. But I also know you also landed at the top of a Western conference full of 50-win teams, teams you were never supposed to beat; I know this is a legacy at stake for you, Phil, to get that record 10th ring; and for you, Kobe, to get the 300-pound Shaq gorilla off your back. I’m not even going to mention his Airness. But he’ll be watching the game, too. Go get us a W.